You may or may not know that Powder Perfect now has all the stamping things. I have been giving the stamping plates a very very complete testing. Stamping isn't my sharpest skill, so I want to make sure I try the plates out in tons of ways before I give my final opinion. One of the ways I am testing them...is by doing Holiday mash-up art! 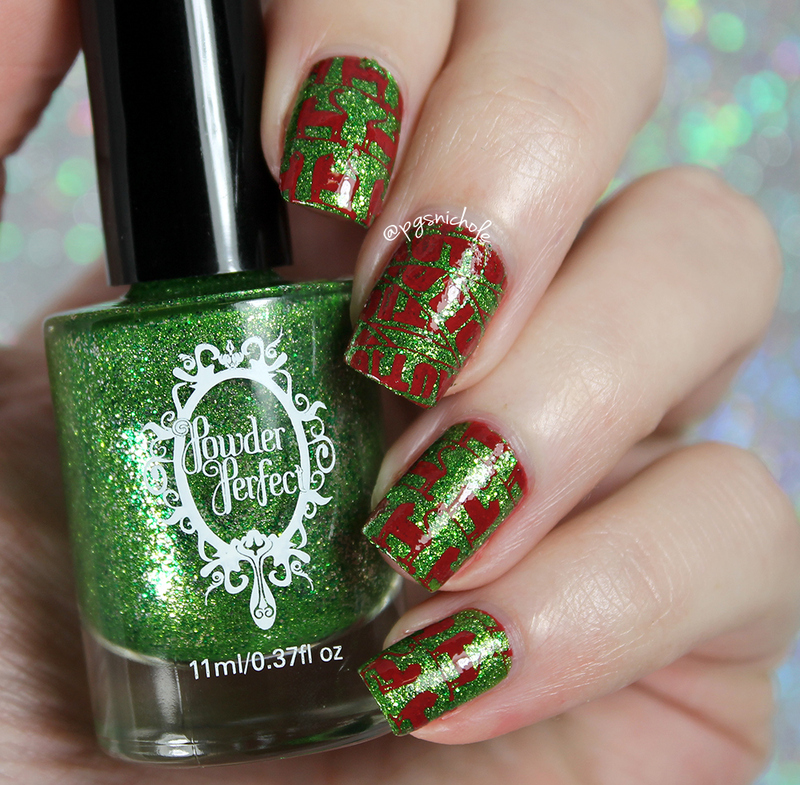 I told you guys that I hadn't had enough of Halloween...so I am wedging it into Christmas. It was a perfect excuse to use the Halloween plate and the red stamping polish. Both were amazing, btw. I used my clear stamper from Wistonia, and it picked it up so crisp and awesome. I had previously tried to use the clear stamper from MoYou...and yeah. No dice. But the Wistonia and the marshmallowy one from BPS worked wonders. I feel like the images I chose actually have a bit of an "ugly sweater" vibe to them. Especially the Halloween kitties. I just adore this manicure all together. It appeals to the Halloweenie in me. How did I do? Do you get that cheerful-yet-spooky vibe from these? I definitely do, though no one noticed my spooky nails in real-life. If you want to test these out for yourself, I do have a wee (non affiliate) code to share: if you enter "BEAUTYSTAMP" at checkout from now until the end of January, you can get 10% off your stamptacular order! Hahah Halloween forever. This manicure is perfection. I had to do a double take that it was Halloween stamping. I have yet to try this brand but this shade of green is so pretty. Oh Nichole...... furever a cat lady! 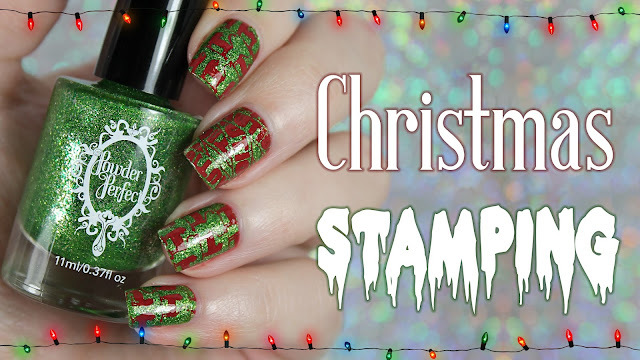 Love that green that you used for the stamping! Oh my gosh, so fun! I love the colors! I love this!!! 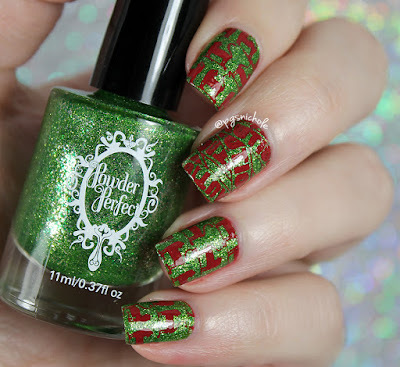 That green is amazing and the stamping flawless! This makes me want to STAMP ALL THE THINGS. Nothing like having the right equipment to do the job well. LOVE IT! That green base is stunning! Oh my, these are incredible! Your stamping is amazing! HAHA I love how in denial you are. Stretch it out as long as possible! Happy Halloween Holidays!! You can't go wrong with green and red this season! 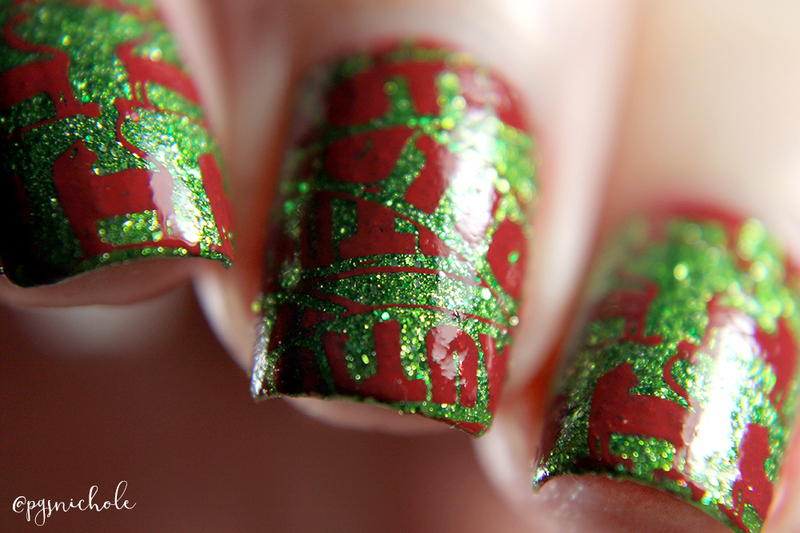 I think this would have been a great Christmas mani whatever you stamped on it because the colours are so perfect! And nope, I didn't notice anything spooky, sorry! Lol! This is so funny! Love the base color you chose. Lol so sneaky! Maybe I will try some Christmasween nails. Your stamping is so clean and crisp!! I love this! It's just Christmas enough to be Christmas, when you get up close, nope! Your manicures are always BOMB! 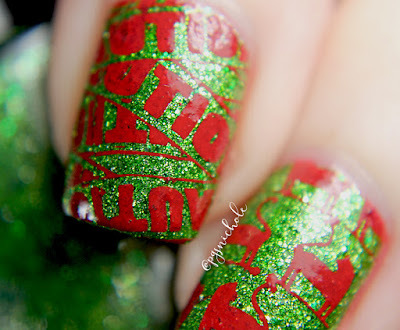 This is such a festive and creative look!